One of the most creative producers ever is back and he brought his son P. Foreral along with him. Dope beats, lyrics, skits and spoken word. Since coming on the scene with De La Soul, to Handsome Boy Modeling school, to now, Prince Paul never disappoints. 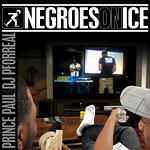 Negroes On Ice is about a father (legendary Producer Prince Paul) and a son (Paul Jr. aka P. Forreal) who find common ground in the language called rap and the beats that drive the rap bus...it is over-the-top ridiculous, but that's the point. It highlights the different schools of thought amongst the generations, but also illustrates how folks of our generation who are parents can relate to the youth better because of this shared language and culture. Prince Paul invented the hip hop/comedy concept album with A Prince Among Thieves which, like Negroes On Ice, blended music and storytelling, resulting an a hilarious, head-nodding listening experience. Also features multiple appearances by Breeze Brewin of The Juggaknots, one of the central figures on A Prince Among Thieves. Includes download card for the Prince Paul produced instrumentals for the entire album.